Daily Stand-ups have a frequent problem: the talkative coach (or Scrum Master). There's nothing wrong with their speaking during the meeting, but if we want the team to take ownership of the work, the developers need to do most of the talking. Coaches usually mean well, but they often come from a management background in an organization where work is assigned to developers and answers mainly come from management. This creates a pattern of developers expecting problems to be solved by management. We want to create a new pattern, where they solve most of the problems on their own. 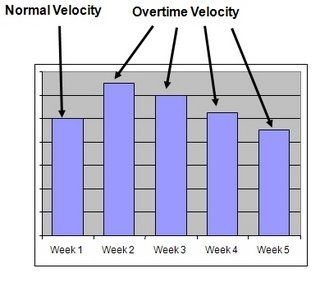 Coaches need to coach developers through these pattern changes. This requires emboldening them and sometimes creating a void that they must fill themselves. A good practice for coaches is to ask questions - even questions they might know the answer to - and to wait for the answer. The practice is to silently count to 10 seconds after you ask the question. 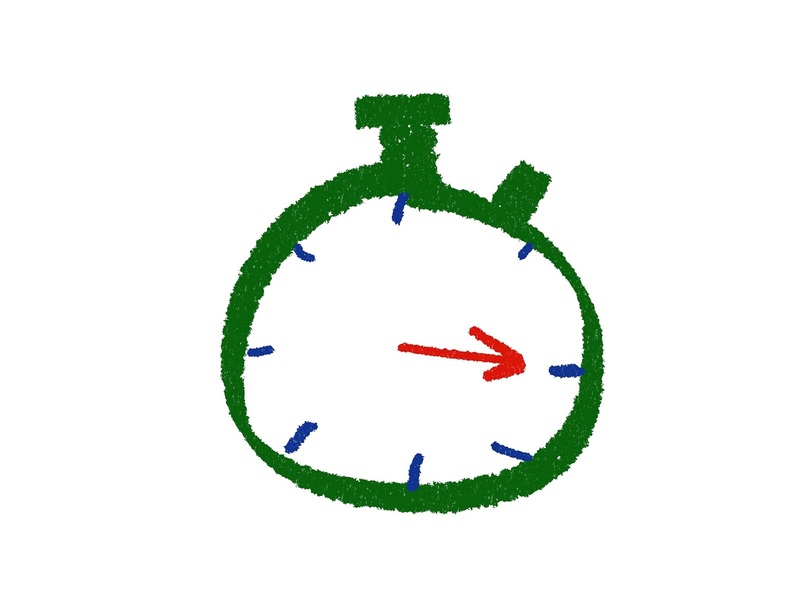 Don't be surprised if it takes 6-7 seconds before someone speaks up...long silences can be uncomfortable for a developer who knows the answer, but is a bit shy in speaking up. If you get to 10 seconds and no one has spoken up, ask a bridge question; a question that is easier to answer and gets you halfway there. Coach: "Are we on track to hit our sprint goal this week?" Coach: "OK, are there any things that you might be worried about?" After a few seconds a developer speaks up: "I'm not sure I'm creating the right animations for the melee". Another developer speaks up: "I can sit with you after the meeting and go over what we need". Creating a pattern of solving problems among developers, without direct management supervision will give you one of the greatest benefits of self-organization. Having eight people solving 90% of the problems is a lot more efficient and effective than you being the bottleneck. On June 6th 1944, D-Day, the largest seaborne invasion in history began the liberation of German-occupied northwestern Europe. 156,000 soldiers landed on the beaches of Normandy or were air-dropped behind German lines. The battle could not have been won without extensive planning, but the it did not go according to plan. Many paratroopers landed far from their targets as did landing craft. German defenses were stronger in some areas forecasted and weaker in others. What made the battle successful was not the plan, but a combination of the knowledge gained in planning, plus the initiative taken by soldiers and units to adjust as reality emerged. This is captured in Eisenhower's quote above. I'm often asked "how much should we plan?". The answer is always necessarily vague. We plan differently for things that are certain and for things that are uncertain. Planning for things that are certain ensures that we are focused on a shared goal. Planning for uncertainty results in a prioritized list of experiments that will remove uncertainty so we can make better decisions in the future. - Deciding the genre of game. - Deciding what engine to use. - Knowing what constraints a franchise has. - Deciding how many bullets each weapon carries in a magazine. - Deciding how many NPCs are in each view. Deciding earlier or later depends on the cost of making that decision. The phrase "deciding at the last possible moment" applies. You shouldn't decide how many NPCs should be in view until your graphics engine is running well enough to tell you how much it can draw at 30 FPS. Conversely, you don't want to decide which engine to use a month before you release your game. The graph shows the cost of planning based on how much of it we do (the red curve). This curve is based on two components: How much planning we do on uncertain things and how much planning we do for things we are certain about. 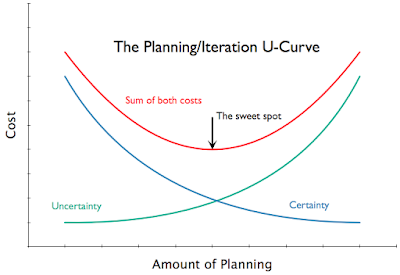 The green curve shows the cost of planning away uncertainty with detailed design up-front. As we do more up-front planning--making more and more decisions about the details of our game--the cost of those early decisions adds up. For example, when we've designed and built numerous gameplay missions based on speculated numbers and behaviors of NPCs, the cost of reversing those decisions late in development increases. 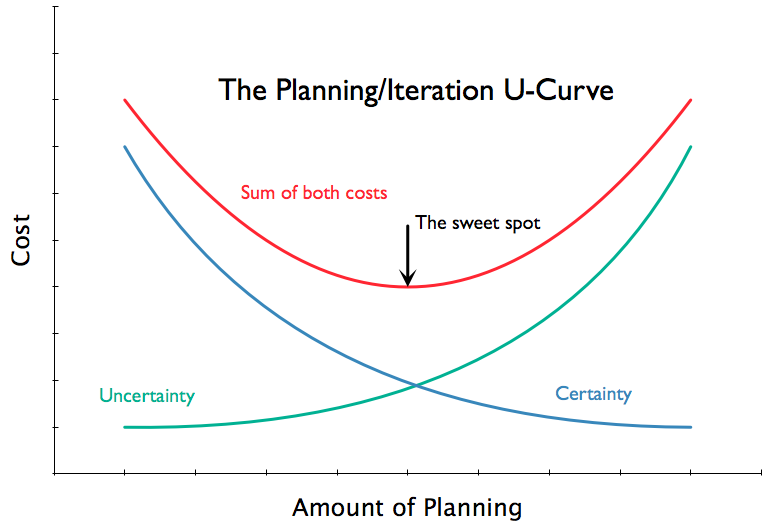 The blue curve shows the the costs of planning things we are (or become) certain about. If we don't make decisions about the engine, game genre or even what programming language to use, the cost of making those decisions later will impact us more. We can make lots of decisions early: NFL games have 32 teams and stadiums. 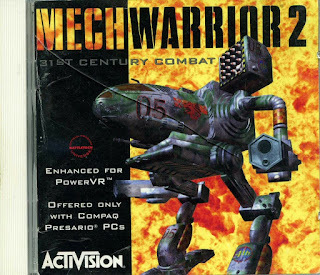 FPS games have online multiplayer. Mobile games should at least run on iOS and/or Android. The red curve is the sum of those cost curves and the sweet spot is where the cost is lowest. So, getting back to the "how much should we plan?" question, the answer is "where the cost between planning and iteration is lowest". This depends on the uncertainty of various parts of the game and the cost curve is different. Determining that starts with an honest assessment of the risks and uncertainty of your game and a willingness to take steps into the unknown in places you may have only felt comfortable trying to plan-away in the past. How often do you reach an alpha milestone on schedule only to have post-alpha work bite you? Extended crunch, cut features and assets result in burn-out and a game’s quality damaged by last-minute compromises to get it out-the-door. The culprit is usually “debt”. Debt is that extra work which takes a feature from "works on my PC" to a feature that a player who buys the game could use. Like financial debt, development debt has an interest rate; the longer you hold onto the debt, the more expensive it becomes to eliminate. It's also not just technical debt. Art and design debt exists as well. • “It’s coded” (or “it compiles”). Usually there is no agreed-upon definition. This is a big warning sign on the road to death-march-ville. One of the initial challenges in adopting agile is defining a more frequent and universal definition of done (DoD). As with all agile practices, it’s emergent; Teams inspect and adapt the game and their work and continually improve the DoD. 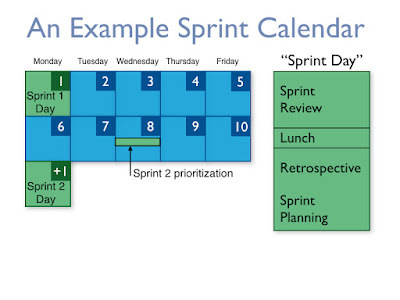 For Scrum every sprint must meet this definition of done before being accepted as done by the product owner. 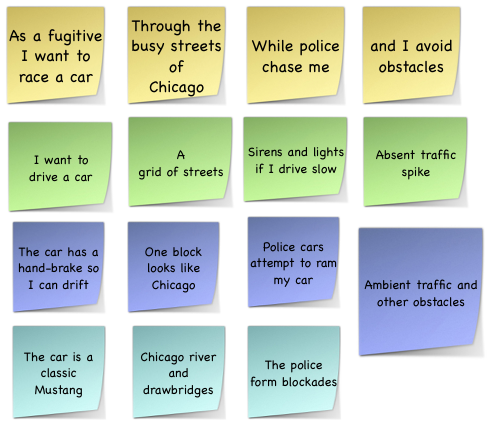 For Kanban, a work item cannot be pulled into the next stage until it meets the definition of done in it's current stage. For example, a rigged model cannot be pulled into animation unless all the naming conventions for the skeleton are met. • …and so on Non-functional requirements are never done. Any feature added or tuned can impact frame-rate, so by the end of a sprint we must ensure that any work added does not slow frame-rate below a minimum standard. If it does, it's not considered done. Because potentially shippable doesn’t always mean shippable, there often needs to be more than one DoD, I’ve seen teams create up four DoDs, which cover anything from “prototype done” to “demo-able done” to “shippable done”. These identify the quality and content stages that large features, which take longer than one sprint to be viable (called epics), must go through. 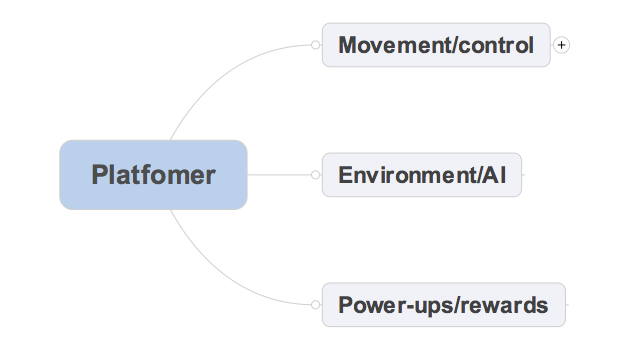 Keep in mind, that these definitions shouldn't allow the team to "waterfall" the work. Even if you have a set of cubes flying around for targets, before animating creatures are ready, those cubes can't crash the game or impact frame-rate too much. If cubes are killing your frame-rate, you have more important things to address before adding animating creatures! The best implementations of DoDs start small and grow (that can be said of a lot of good practices). Start by identifying a few of your larger areas of debt in a retrospective and pick some low hanging fruit DoDs. For example, if basic stability is an issue, a definition such as "the game can't crash while using the feature" is a good starting place. Don't be surprised if this definition impacts how much the team can commit to every sprint: quality costs...but that cost will be recouped with interest over time as practices are improved. 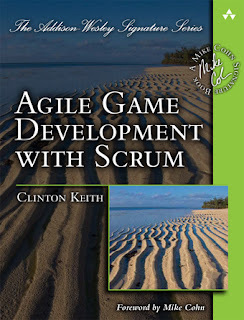 When we started using agile, I’d hoped we could do away with the alpha and beta stages of game development. 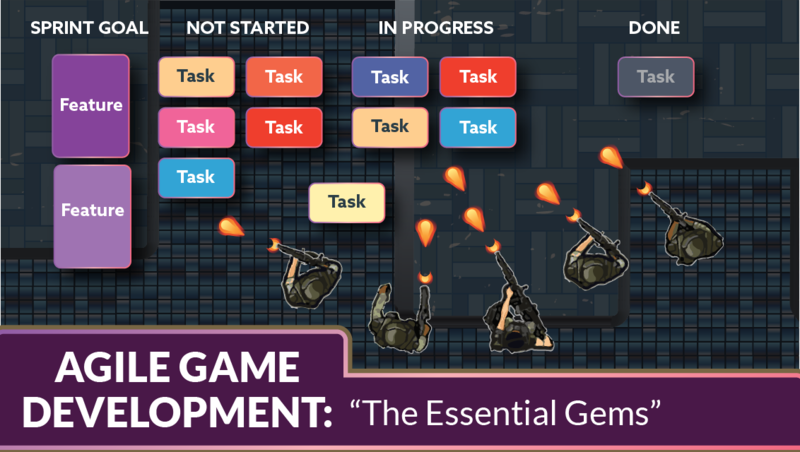 In practice, for major initial release of a game, we still needed time after feature-complete to balance the game. What we did lose were the death marches and compromises. When to adopt agile on your game? A frequent concern for adopting agile practices is when to do it. Most would prefer to do a major transition of practices and roles at the start of developing a new game. There are definitely benefits in timing training and a shifting of roles and responsibilities then, but it's not the only option. Often teams will start getting into trouble with quality issues and looming ship dates as they close in on that ship date. They'll want to make changes but assume it's too late. It's not. Recently I visited a team that was a few months away from their first release on Steam. They were confronted with a ton of debt and there wasn't much direct cross-discipline communication going on. After some training, which included deep conversations about the short and long term vision of where to go, they decided to focus on prioritizing the debt and improving the definition of done. This slowed down the introduction of new features they wanted, but it allowed them to better triage the quality of the game. They agreed that the quality of the existing game was more valuable than the number of features. What they didn't do was radically reform the teams to make them perfectly cross-discipline. A few key changes were made and some over-multitasked people were helped out, but we agreed that overhauling the entire organization at that point was too risky. This training and discussion took several precious days away from people focused on delivery, but we felt it was worth it. Sometimes we get so focused on what we're trying to do that we forget how we're doing it and how we can improve that. There are all sorts of reasons for extended, enforced crunch (or death marches) in game development (I'll just call it crunch here). They are all avoidable. Below is a list of 10 of them from my experience and a brief description of proven solutions. It’s OK to have a fixed schedule for games, but when you fix the scope as well, you’re asking for problems. Forget about being able to plan enough to eliminate that uncertainty by remembering Hofstadter's Law: "It always takes longer than you expect, even when you take into account Hofstadter's Law." Solution: Scope is the best and most flexible tool. Use a prioritized scope, develop from that and derive your schedule. 2. Technical debt in the form of bugs and late optimization. Solution: address debt as soon as possible through an iterative approach that frequently delivers potentially shippable builds. There are a number such approaches; test-driven development is a popular one. 3. 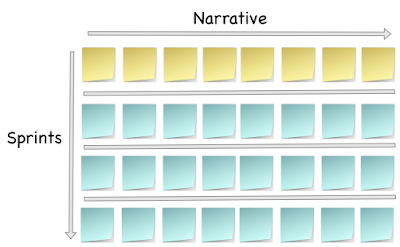 Content debt in the form of a minimum required set of polished assets that have to be produced after the mechanics are created, to tell a story or provide a minimum gameplay experience. Solution: Build increasing fidelity prototypes and tests of assets during preproduction to measure and extrapolate the cost and schedule for full production. 4. Design debt in the form of waiting until all the technology and assets are in place before discovering whether the experience is fun enough for a full good game. Solution: Use iterative development is used to explore gameplay and to “find the fun” early. We all know that the scope we ship is never what we initially planned and that feature creep is inevitable, but if there is a lot of debt being carried, it's hard to measure true progress. This makes it hard to gauge the impact of additional features requested. We end up backloading the game with even more "90% complete" features and therefore even more debt. Solution: Address debt first, so that the true cost of features can be measured. Then prioritize the feature list so that you can have conversations about where additional features can be added and what features are demoted as a result. As long as it's understood that the feature list is not a promised set of features, but a prioritized one, where the lowest priority features can be dropped, feature creep can be managed. Middle management has made promises to stakeholders that can’t be kept and enforces extended crunch on development in an attempt to hide it. Solution: Upper management needs to create a culture of transparency and not punishing those who deliver the bad news. Avoiding the areas of greatest uncertainty, such as unproven mechanics or new hardware in the hopes that it won't manifest. When the risk triggers, it’s too late to do anything smart about it. Solution: Embrace risk and prioritize work to mitigate it as early as possible. The inability of the team to make the game envisioned, due to missing skill-sets or a lack of experience. Solution: For the short term, a risk-prioritized approach, will inform you early that the team existing cannot make the game hoped for (see courage). For the long term grow your people through mentoring and training. For a many decades, businesses have known that crunch isn't effective past a few weeks. The data is clear. Sure, some extra time now and again isn't bad. At times I've had to drag myself away from the keyboard after marathon sessions, but that doesn't mean we can or should do it for months. Solution: As a manager who was guilty of this, I had to measure what was making it into the game, rather than just measuring how many hours people were at work. That demonstrated the loss of value we faced with extended crunch. That was the last time I enforced it. The attitude that game developers are fungible, that crunch is part of the territory if you want to make games and that they are to blame for a bad process. Solution: Quit and work someplace that respects you. What is missing? What are solutions have you seen? Let me know and I'll add it to the list (with credit to you). I was sitting around this morning with my coffee thinking, "what the world needs is another 'X Driven Development' approach to creating products". Well, not really, but I have been thinking about this approach for awhile and observing it in action. This post describes a variation on how some agile game teams have changed their approach to planning and executing sprints. A video game usually has several core mechanics that we want to develop in depth. For example, a platformer might have movement/control, environmental challenges/enemies and power-ups/rewards. These are core mechanics. They are core because we have to ship with all three and they are core to the player experience. Outside the game industry, this might be called the minimum viable feature set. This is different. 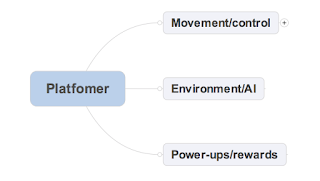 Mechanic Driven Development (MDD) focuses on delivering a narrow set of features each sprint, which are dynamically linked to move a mechanic's playability forward. Now we have running, jumping and offensive moves, each broken down further. In what order does the team develop these items? In mechanic driven development, the question for the team becomes, "what can we do over the next iteration to move this mechanic forward?". In other words, "what's the most important work we can do for the movement/control to make the game more playable"? To me, running and jumping would seem to be the most important. Other people might feel differently. We'll talk about it as a team (including the product owner). This conversation builds vision, creates consensus and drives developer engagement. The resultant sprint goal contains progress of some or all of the sub-mechanics derived from that discussion. When a team does this, the result is a sprint that is measured by the progress of the mechanics rather than a collection of stories completed, etc. What benefits does MDD bring over more traditional approaches? It engages the team in discussing the game's mechanics as a target every sprint, not just the completion of a set of stories. It creates opportunities for more creative input from the team. A ton of small user stories from the backlog often suppresses creativity. MDD is a direct application of the "working software over comprehensive documentation" value in agile. It'll often result in a direct path to playability and an elimination of excessive work called out in a detailed plan written in a design document. This approach can also be used with a detailed design document. We just prioritize the work and sprint deliverables that grow the mechanic and reflect the emerging game against the plan. I'm often asked about how other teams organize their sprints. Below is an example calendar and checklist (click on the image) one team used to review, retrospect and plan their sprints effectively. 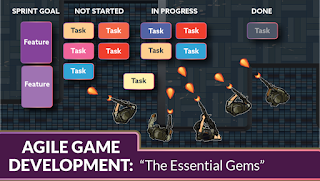 In a week, I'll be launching my first online training course on Agile Game Development. This first course is an overview of Scrum and Kanban for game development with a focus on the values and principles (gems) of *why* we do it. My aim was to provide broad training to many of the developers who don't get a change to attend onsite or offsite training. The training is hosted thought FrontRowAgile.com, which hosts training for other areas of agile (such as agile estimating and planning training by Mike Cohn). Members of the mailing list will receive discounts for training. Video Blog - Why Agility for Video Game Development?